(VIDEO) Terror returns to Netanya: A powerful explosion shook a Netanya shopping center at 11:30 in the morning. Five people were murdered and over 50 were injured, four of those in critical condition. Four of the five victims have been identified as Alexandra Zrinitzki, 65, of Netanya, Iliya Rosen, 38, of Bat Hefer, Daniel Golani, 45, of Nahariya, and Khaim Amram, 26, of Netanya. Magen David Adom emergency crews evacuated the injured, including four who are in critical condition, to Netanya's Laniado Hospital, Kfar Saba's Meir Hospital and Hillel Yaffe Hospital in Hadera. Islamic Jihad's military wing, the al-Quds Brigades, claimed responsibility for the terror attack and identified the suicide bomber as Lutfi Amin abu-Salem of the West Bank village of Rai, near Jenin. Sources in the group said the attack was carried out because of "Israel's ongoing crimes, despite the calm." The terrorist detonated a bomb which he was carrying in his bag, as he approached the entrance to the mall near the Herzl Street bridge. The suicide bomber blew himself up meters from the entrance to the shopping center. He carried his explosives device in a bag. According to witnesses, a female police officer and civilians passing by identified the terrorist as a suicide bomber, and managed to shout out warnings to others. The guard to the shopping center prevented the terrorist from entering the building, but could not prevent him from blowing himself up. He was killed as he prevented the suicide bomber from entering the mall. Blood strains were found as high as five meters up on the wall of the mall, and pieces of glass flew in every direction. Even tree branches were ripped apart in the vicinity of the blast. Einav Tzabari, who stood by the nearby courthouse, witnessed the attack. "We saw the mall's guard approach a man carrying a bag. The guard pulled the terrorist towards the direction of the sidewalk, placing distance between the bomber and the entrance to the mall. We heard shouts. Two police officers arrived at the scene, and stood with their back towards the bomber and the terrorist, and then the explosion happened. We saw things flying in the air, we immediately understood this was a terror attack. We ran to the scene, saw bodies, and injured people, but there was one picture that is impossible to forget: A young woman trying to wake up another woman, who was lying down and not moving." A young woman who recently worked as a security guard at the mall arrived on a motorcycle. She sat on the motorcycle and cried, after being notified that one of the murdered victims in the attack was the guard. She had worked with him, and told of how they had been friends. "I still hope it's not true; that he was only injured and not killed," she said in a broken voice. Osnat, a local shop owner and eyewitness, told Ynet she heard a large blast near the bridge. "The entire mall trembled," she said. "There was panic; everybody fled the scene, only the store owners stayed inside the mall." Zion Vatori, owner of a car yard opposite the mall, said this was the third time he had witnessed a terror attack. "There was a strong blast, stronger than the last explosion at the entrance to the mall. We saw a huge cloud of smoke rise above the area. I can still hear the explosion in my ears," he said. Netanya has experienced many terror attacks in the recent years. up at a main junction downtown, killing five people and injuring dozens. The Islamic Jihad claimed responsibility for this attack as well. The defense establishment has received dozens of alerts indicating that terror organizations may try to carry out attacks during the tense period ahead of elections in Israel and in the Palestinian Authority. Many terror attack plans were thwarted during the last months. Shin Bet reported that there have been nine terror alerts for attacks within Israel, and another 40 intelligence reports pertaining to terror activities. Sources in the defense establishment said there was no concrete alert about an attack in Netanya. As a result of the attack, police increased its deployment across the country, and erected roadblocks on highways and in cities. 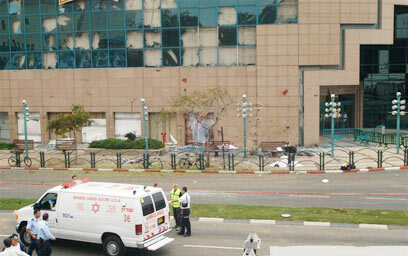 David Baker, a top official at the PM’s Office, told Ynetnews in response to the attack, “The PA refuses to take even the most minimal measures to prevent terror against Israel; they refuse to arrest the terrorists, they refuse to lock them up and they refuse to dismantle the terror organizations such as the one that carried out today’s attack." 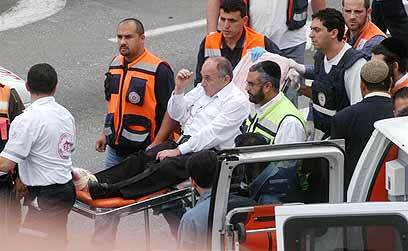 See all talkbacks "5 killed in Netanya bombing"